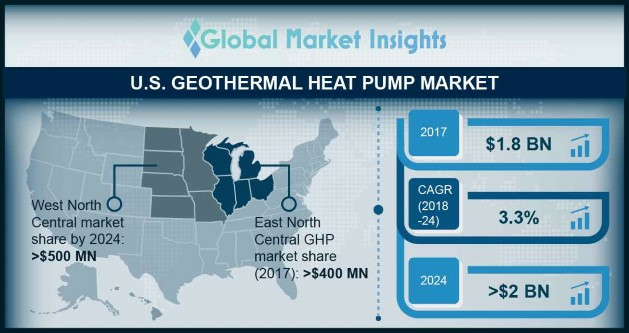 U.S. Geothermal Heat Pump (GHP) Market size will surpass USD 2 Billion by 2024, as reported in the latest study by Global Market Insights, Inc. Rising focus to enhance energy security, improve climatic condition coupled with government reforms to minimize carbon emissions will provide stimulus to the U.S. geothermal heat pump market size. Increasing penetration of renewable energy technologies along with strict government norms and mandates toward green building infrastructure will further complement the industry dynamics. In 2018, U.S. EPA established International Green Construction Code to improve the environmental performance and health of building, sites and structures. West North Central geothermal heat pump market is predicted to reach over USD 500 million by 2024. Surging demand for sustainable and efficient space heating and cooling system subject to accelerating investments toward the construction of single and multi- housing units will boost the product demand. Government measures to promote the adoption of green technologies along with stringent norms pertaining to GHG emissions will further augment the business outlook.